Saunas are relatively new in the United States . Early Finnish and Swedish colonists made their own Saunas right from the start of this country but Sauna usage did not grow much beyond those immigrants until the late 1950’s and ’60’s. Whether early Finns knew it or not they had discovered a very healthy ritual. Saunas were rediscovered in America for their relaxation and many health benefits. 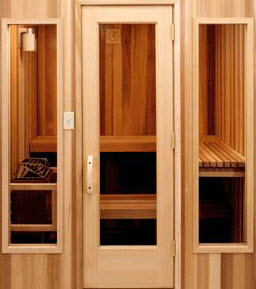 The main benefit of Sauna is that it opens the pores and flushes out the body’s toxins and impurities. It is the deepest cleaning bath in the world. The Sauna soothes and relaxes tired muscles, helps maintain clear, healthy skin, provides a cardiovascular workout, burns as many as 300 calories in a session, increases metabolic rate and improves circulation. Finlandia Sauna is one of the oldest Sauna companies in the U.S. and has been manufacturing the highest quality Saunas since 1964. Our president is a native of Finland and grew up in the Sauna culture. He strives to promote the authentic Finnish Sauna in America . Finlandia prides itself on its quality and does not cut corners when it comes to using the best material. We are the only manufacturer that still uses the original industry standard of true 1″x 4″ (3/4″ thick) wood paneling. Our company has everything for your Sauna needs. We make precut and prefabricated Sauna rooms. We manufacture custom precut Sauna packages to fit any size room. You provide the room dimensions and we cut it to size. Our modular prefab Saunas are built with an exclusive locking system for easy installation. These rooms can even be taken apart and moved to a new location. Our Sauna heaters are imported directly from Finland and provide the best, most dependable heat and humidity. 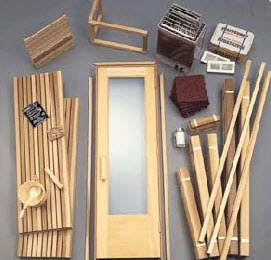 Finlandia offers a wide variety of Sauna accessories and beautiful door designs as well. Use Finlandia’s expertise and let the Sauna experts design and build your Sauna today. Finlandia prefab Saunas are complete, freestanding, self-contained rooms engineered with fast and effortless installation in mind. They can be put anywhere you have an open space. You must provide the waterproof floor (concrete, tile, or vinyl). FPFs contain all interior and exterior parts. Our prefabs can be installed by the homeowner over any hard-surfaced waterproof floor. We have an exclusive locking system inside each of our panels which makes our prefab the fastest to install, the strongest, and the most custom looking Sauna on the market. Our wall sections go together without any screws, splices, or bolts. Electrical hookup is made easy because we have electrical conduit sealed within the walls, and the optional wall control is pre-mounted. Our outdoor Sauna is the same as our FPF Sauna except that it comes with an unassembled cedar shingle roof package. You supply the waterproof pad and we provide the insulated modular room. The roof package includes wood plates, prefab rafters, nailers, facing, metal flashing, cedar shingles, ridge cap, and nails. You put it together. It includes the same components as the standard FPF package. Also, it includes an outdoor light switch. The Finlandia Outdoor Sauna is available in sizes ranging from 4’x 4′ to 8’x 8′.